New Zealand dairy group A2 Corp. has signalled it plans to enter the US market through the establishment of a local subsidiary. The company said a US launch had been "under consideration" for "some time". With sales in the UK now growing from a small base, A2's board said it believed pushing ahead with a US roll out was now a "priority". 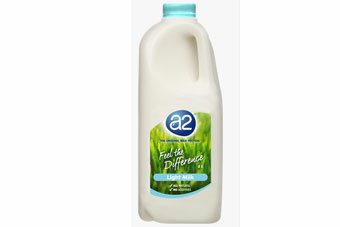 A2 makes milk from cows that produce the A2 beta casein protein rather than A1. The product is targeted at lactose-intolerant consumers. The company said its "strong intellectual property rights and know-how" leave it well-positioned to grow in the country. "The plan would involve the company establishing its activities through a wholly owned USA subsidiary and recruiting a small management team with in-market experience. As part of the development, A2 brand milk will be showcased at a major natural foods exhibition to be held in California in March." A2 did not provide a time frame for its planned expansion in the US. However, delivering the company's first-half results, MD Geoffrey Babidge said: "Our confidence in the development of the group over recent times has enabled the company to advance North America as the next priority growth initiative." The company said it saw sales in the half-year to the end of December surge 22% to NZ$54m (US$45.1m), with growing market share in Australia and improved sales trends in the UK. The company also started selling infant formula in China during the period. EBITDA sank to NZ$2.5m, down from NZ$3.4m in the comparable period of last year. Earnings were down due to higher investments, as the company stepped up marketing and expanded into new geographies. However, A2's net income was up from NZ$554,000 a year earlier to NZ$643,000. Revenues grew strongly over the corresponding half as a function primarily of ongoing growth in a2TM brand fresh milk in the Australian market. The revenue growth in AUD on the prior corresponding period was 28.3% and the a2TM brand remains the fastest growing dairy brand in grocery in Australia. The launch of a2TM PlatinumTM infant formula to consumers in China, Australia and New Zealand took place during the half. New arrangements to accelerate development of the business in the United Kingdom were progressed with acquisition of the UK joint venture completed on 1 January 2014. A plan to enter the North American fresh milk market is progressing. Managing Director Geoffrey Babidge said "the continuing strong performance of the Australian business together with the momentum building around our priority initiatives in the United Kingdom and infant formula were the highlights of the first half. Our confidence in the development of the Group over recent times has enabled the Company to advance North America as the next priority growth initiative." The unaudited Group Profit after Tax for the 6 months ended 31 December 2013 was $643,000. The appreciation of the NZD to the AUD reduced Group revenue growth by approximately $6.4m on the prior corresponding period. A second shipment of infant formula to China took place in November 2013 following our first shipment in June. Cash on hand at 31 December 2013 was $13,156,000. The movement over the period primarily reflected operating cash inflows from Australia of $6.2m which contributed to funding the working capital build for infant formula ($4.4m), launch costs for infant formula ($2.7m) and cash investment in the UK joint venture ($4.5m). The FY13 strategic agenda centred on the increasing profits from the Australian business funding revenue growth in the priority markets of the United Kingdom and China. To the extent revenue growth in the UK is tracking behind plan, this is offset by enhanced performance in Australia and additional product and market opportunities being pursued. During the half the management structure was reorganised into regional and corporate functions and strengthened with additional experienced executives recruited to assist the new market initiatives. This included the appointments of Susan Massasso as Chief Marketing Officer, Philip Wohlsen as General Manager Asia and recently Scott Wotherspoon as Chief Executive Officer in the UK. The structure and composition of the Board has been also been strengthened with the recent election of Ms Julia Hoare and Mr David Hearn as non-executive directors. a2TM brand sales in Australia continued to grow strongly with an increase on the prior corresponding period in AUD of 28.3%. The Company continues to be a leader in marketing activities within the milk market in Australia. These activities together with public relations, health care professional engagement and social media activity continue to build awareness in the A2 proposition and the brand. We estimate the market share of a2TM brand fresh milk to approximate 8% by value in the grocery channel (latest quarter Coles, Woolworths scan) in December 2013. Growth in volume and continued improvement in efficiencies at the Company's milk processing facility in Sydney, NSW resulted in an improved gross margin as a percentage of sales when compared to the performance over last year. We continue to focus on enhancements to supply chain processes and building milk supply to cater for ongoing growth. As part of this from November 2013, Brownes Food Operations commenced processing a2TM brand fresh milk in Western Australia under a supply and contract pack arrangement. The Company continues to assess ways to enhance processing capability in conjunction with its other contract processors in Victoria and Queensland. In September 2013 the Company commenced the distribution of a2TMPlatinumTM infant formula to grocery and pharmacy stores in Australia and New Zealand supported by a launch advertising campaign from October. Early sales performance in Australia is positive whereas sales in New Zealand are modest given limited grocery distribution achieved to date. The Company continues to assess opportunities to broaden the portfolio of a2TM brand products and in January 2014 launched a2TM Thickened Cream into the grocery trade in Australia in conjunction with a contract packing agreement with the highly regarded Australian dairy company, Regal Cream Products. Momentum within the UK business continued to build during the half with sales and distribution increasing progressively particularly during the second quarter. The objective has been to build consumer trial and rate of sale in key grocery accounts to support existing ranging and justify more substantial distribution over time. During the half the business achieved increased distribution within the Tesco chain, achieved growth through the online Ocado business and grew rate of sale faster than at any time since launch. In addition, our objective to focus on building distribution in the south east of England was progressed with ranging now extending to around 250 grocery stores within the M25 motorway region. A print and outdoor advertising campaign focusing on digestive benefits of a2TM fresh milk was undertaken in November and was a positive for the brand. Further marketing and communication initiatives are under development led by our recently appointed Chief Marketing Officer. Our contribution to marketing costs for the half totalled £324,000. During the period, we continued to support our farmer supplier base. In 2012 the business implemented an incentive scheme (in addition to the A2 raw milk premium) to support aggregation of a2TM herds by 2014. Our share of testing and conversion costs for the half totalled £37,000. In November 2013 we announced a change in the structure and operation of the UK business whereby the Company would fully acquire the interest of Muller Wiseman Dairies (MWD) in the joint venture for nominal consideration and enter into a supply and contract pack agreement with MWD on a cost plus basis. This transaction was concluded on 1 January 2014 and enables the Company to move in a more focused way on building distribution and sales whilst continuing to leverage the scale and operational capabilities of MWD. The UK board of directors was changed with the appointment of William (Billy) Keane, the former Managing Director of Robert Wiseman Dairies and current Chairman of Dairy UK as a second Non- Executive Director. David Hearn continues as A2C appointed Non-Executive Chairman and Geoffrey Babidge as the third Director. We also recently announced the appointment of Scott Wotherspoon as Chief Executive Officer of the UK business who brings strong skills in sales, marketing and entrepreneurial businesses to the Group. The Company is committed to the successful development of what is currently a small but growing UK fresh milk business and is encouraged by the progress of recent initiatives. Following the acquisition of MWD's shareholding, A2C will solely manage, fund and benefit from the ongoing development of the business. The investment in the UK business during calendar 2014 is likely to be in the order of £5m. During the half, the first sales of a2TM PlatinumTM infant formula to consumers took place in China. A key focus has been to support our distributor, China State Farm (CSF) in developing initial communication strategies through our joint marketing structure and their recruitment of sub distributors in key provinces in China. This support has included regular visits to China by Group management, attendance at launch meetings with potential sub distributors and participation in a formal launch ceremony held in the Great Hall of the People in Beijing in October 2013. A further priority has been to participate with our contract supplier, Synlait Milk Limited (Synlait) in establishing the a2TM PlatinumTM supply chain. This incorporates the integrated management of receiving A2 milk from farm, production of a2TM milk powder, blending and packaging of finished product and delivery to customer. As part of this, the Company has developed its own quality processes to manage product integrity throughout the supply chain. In consequence of implementing the new processes and an ingredient supply shortage, we experienced delays in a planned shipment to China and Australia in December. The launch to consumers in China commenced during November 2013 targeting baby maternity stores, high end supermarkets and on-line sales. CSF continues to build the distributor network and currently has arrangements in place with sub distributors in 13 provinces in mainland China. a2TM PlatinumTM offers the unique natural attributes of an infant formula which contains only the A2 type of beta-casein protein and is positioned as a super-premium product. The regulatory environment for infant formula in China continues to evolve given the Government's aim to improve product quality and bring confidence back to the industry. These changes are currently focused on regulating participants operating in the domestic market and registering manufacturers exporting into China. The Company will continue to closely monitor and respond to developments. The regional management structure for Asia has been established to support the development of the infant formula business initially in China and in other Asian markets and the launch of additional products such as UHT milk. At the recent shareholders meeting, approval was given for the Company to enter into a UHT supply agreement with Freedom Foods Group Limited and Associates. Planning for UHT milk products is progressing. The launch of a2TM brand fresh milk into the United States market has been under consideration for some time and is to be the next priority growth initiative. Given the UK business is now established and showing growth from a small base, the Board considers an entry plan for the USA should now be developed. The Company has strong intellectual property rights and know-how in this market and consumer research confirms the attractiveness of the A2 proposition. In addition, the industry and market dynamics are considered favourable to a market entry strategy for our product. The plan would involve the Company establishing its activities through a wholly owned USA subsidiary and recruiting a small management team with in-market experience. As part of the development, a2TM brand milk will be showcased at a major natural foods exhibition to be held in California in March. The Company continues to invest in its intellectual capital as outlined at the November annual meeting including development of a global brand vision and brand marks suite, investment in new patents and participation in ongoing research and development. The company is pleased to advise of the acceptance for publication of research supporting the digestive benefits of a2® dairy products by a leading international scientific journal. The collaborative study undertaken by AgResearch NZ provides insight into the biochemical mechanisms underpinning a range of digestive benefits from consumers of a2TM brand milk and corroborates the findings from other studies. NZ: Louttit named CFO at dairy firm A2 Corp.